Google is a common resource for consumers to locate new products. Companies need to adapt to the growing trend of people buying things online. Part of that includes having a well-designed website that is optimized for search engines. It also involves taking advantage of numerous types of marketing. One of those methods is Google Product Listing Ads. Over 3.5 billion searches are conducted on Google every day. By taking advantage of product listing ads and advertising your products, you increase the opportunities of being seen on Google. Google Product Listing Ads (PLAs) are essentially a form of pay-per-click campaign. These are ad campaigns where the business owner only pays if an ad results in a click. The campaign manager determines how much money should be spent overall throughout the course of the campaign. However, if the ads were ultimately successful, then the manager could renew. You will find these product ads on the search results page of a Google search for a certain item. The ads will either be located at the top or on the right-side of the page. These ads will show a picture of the product as well as its name. There will also be a price listing and a link to the merchant’s page. This makes it easier for shoppers to find desired items. How Do Google PLAs Differ From AdWords Ads? 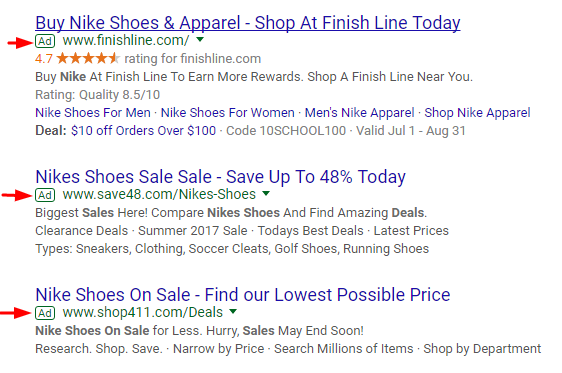 When you search for an item on Google, such as “nike shoes on sale,” you will see many block of test results with detailed descriptions of the searched item. Typically the first three or four text results will be AdWords text ad. There is usually an indicator such as a small green icon that says “Ad” signifying that this is a paid advertisement. It is another marketing method offered by Google that can help online merchants. Both types of ads have their benefits, but it is important to understand the differences, so you know which one is ideal for your business. How Do You Get Started With One of Product Listing Ad Campaigns? To establish a product listing ad campaign, you first need to acquire an Google AdWords account and a Google Merchant Center account. Setting up these accounts is fairly simple. For the merchant center account, you only need to provide basic information about your business, such as the name of the store, your website URL and an email address. You will also need to verify that you are the site owner which can be done via the Google Search Console (formally Google Webmaster Tools). After those are set up, you can submit a data feed consisting of information related to the items you hope to market. You need to have information related to the price and availability of products. Through AdWords you can establish a new marketing campaign. You need to determine what the name of the campaign is going to be as well as your ultimate budget. After this information is inputted, you will be taken a list of products you listed earlier. You can manage the products, which can include excluding certain items from a particular campaign. It is simpler to set up a product listing ad campaigns than text ad campaigns, because you do not have to deal with researching keywords, however you must still remember to manage your negative keywords. Will These Ads Produce a Good Return on Investment? Google gets a lot of traffic every day. While not everyone is searching for products, many people are clicking on the product listing ads on search results pages. Google Shopping traffic and competition have both increased substantially over time. So, getting a positive return on investment with product listing ads begins with an optimized product feed. Then by managing product groups, using a strategic bidding strategy, and monitoring conversions, PLA campaigns can become very profitable. How Can You Have the Greatest Success With These Ads? There are no guarantees when it comes to the success of an ad campaign. However, all business owners should hedge their bets and work hard to increase the likelihood of having a good return on investment. For starters, you need to consider if the products your business sells can be competitive on Google. You also want to think about the overall size of your company’s inventory. The success of product listing ads ultimately comes down how many total products a business sells. Generally speaking, a business should have at least 500 products being listed if it is going to use these ads. The reason for this is that you want to enhance your company’s visibility as much as possible, simply put, it’s a number game. You are not going to get any clicks if consumers cannot find the ads. You also want to think about how much you have to spend on an ad campaign. When you start a new campaign, you need to decide how much you want to spend on each individual click and what the overall budget is going to be. You want to spend a decent amount per bid so that you can be competitive with other, potentially larger businesses. A good budget to set aside for one of these campaigns is $1,000 a month. Finally, you want to make sure your company’s actual website is fully optimized. An ad is going to contain a link to your website. You spend money to get that click, so you want to do your best to convert a click into a sale. Once consumers visit your website, you want them to actually buy something, so you want to make sure the site looks great and is easy to use. If no one ends up buying anything, then you are effectively throwing your money down the drain. Before starting a campaign, you should invest in your website and make sure any rough edges are smoothed out. How Do You Utilize Google Ad Metrics? Google provides business owners with a ton of metrics to measure the performance of a campaign. First you need to make sure that you have either linked to your Google Analytics account or that you have added the AdWords Conversion Tracking code to your website’s conversions page. Once you have enable tracking, you will be able to find a ton of great information, including how many people visited a web page based on an ad and how long people generally stay on the page. This lets you know how successful an ad has been so far. You may also realize you need to make changes. If you are getting a lot of clicks but not very many purchases, then something needs to be done. A good conversion rate comes down to the industry you are in. For most ecommerce businesses, a conversion rate of 3 percent is considered normal. If it is any less than that, then you should look into what factors are affecting the ratio and improve upon them. What Are Mistakes to Avoid With Google Product Listing Ads? A common mistake is for a business owner to not regularly check their analytics. CHECK REGULARLY! One reason for the necessity of this frequency is that you want to catch any errors or mistakes immediately so that they can be corrected soon. Review the search term reports to find any keywords that should be turned into negative keywords, so money is not being wasted searches not related to your products. You want to make sure the images you use in these ads are optimal. The item itself should be as large as possible. It is typically acceptable to simply use a white background, allowing the product to be the central focal point. Are PLAs Right for Your Business? All businesses are different and have different needs. However, all businesses need to start using online marketplaces to their fullest potential. More and more people are turning toward the internet, so you want to have a viable presence. Look into Google product listing ads to see if your company can benefit. If you’re selling your products online and not hitting target goals with your Google Shopping campaigns, then we can help. To learn more about how OperationROI helps our clients increase performance on Google, contact us at 1-888-277-5429, or by filling out our contact form. 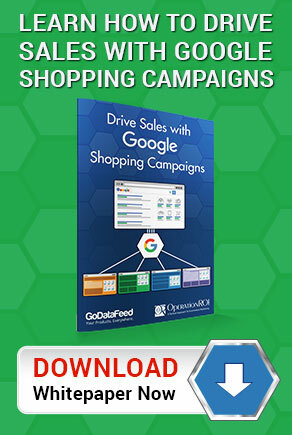 Increase Google Shopping Sales! Contact Us Today!